Rani Mukerji is one of Indian cinema’s most respected, loved and renowned stars. During her incredible cinematic career, the actress has been applauded for her brilliant performances in a range of roles and amazing films. In testimony to her outstanding work and her universal popularity with audiences at home and abroad, the government of Mauritius honoured Mukerji with the ‘Outstanding Contribution to Cinema Award’, as part of their run up to the 50th year of Independence celebrations. The honorable Prime Minister of Mauritius, Pravind Kumar Jugnauth, presented this special award to Rani during the film festival Mauritius Cinema Week. This festival is part of the build up to 50th year of Independence of the Republic of Mauritius from British Rule. 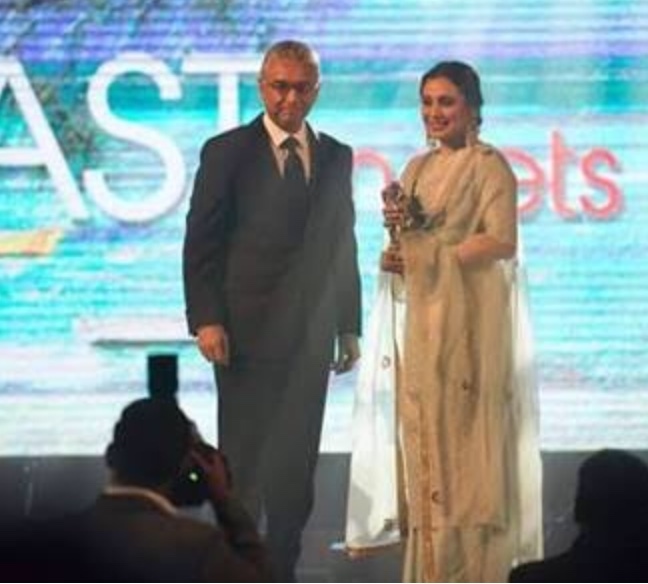 Interestingly, the film festival saluted close cultural and historical ties to both India and France and popular French actress, Emmanuelle Beart was also given the same honor. Rani’s body of work is full of brilliant performances in all genres including comedy, drama, dance and romance and has brought to the screen some incredible and significant celluloid stories. She truly creates magic whenever the camera focuses on her and we eagerly await for the spotlight to shine on her again in her next film Hichki and beyond!